What is the difference between palate, palette, and pallet? Palate is the roof of a mouth. Palette is the board where artists mix their paint. Pallet is a flat platform for loading goods. 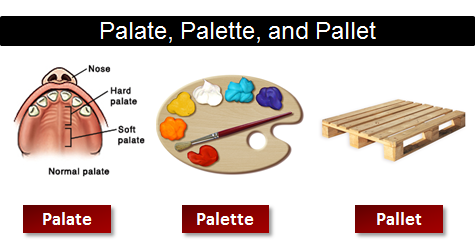 The words palate, palette, and pallet sound similar, but their meanings are very different. The noun palate is the roof of the mouth in humans and other mammals. The flavor of a food (particularly beer or wine) is sometimes referred to as a palate (e.g., a fruity palate). If you're able to taste slight nuances in food, then you have a well-developed palate. In reality, there are no taste sensors on the palate. The noun palette is a flat board on which a painter arranges and mixes paints. You seem to have a lot of red on your palette. Are you planning to shoot the model? The noun palett is a flat wooden structure that supports goods. A palett is typically made of wood and designed to be lifted by forklift trucks. Loads with pallets under them can be hauled by forklift trucks or by pallet jacks. Discarded wooden pallets cannot be used for firewood or crafts.